The makers of 420 Extra Pale Ale know hops and they knew an obvious marketing opportunity when they saw it. “Hash is a gimme,” says head brewer Nick Nock, the man behind the Atlanta brewery’s “hop hash” beers. Hop hash, as it’s been called, is a byproduct of the pelletizing process, something Nock first put to the test in Johnny Hash, a one-off in the Dank Tank Series, then later with seasonals Hop Hash DIPA and this fall’s Hash Brown ale. They’ve now added a year round Hash Session IPA into the mix as well. Nock notes the chewy character the hash gives to the beer, along with an aromatic punch that leads the way. 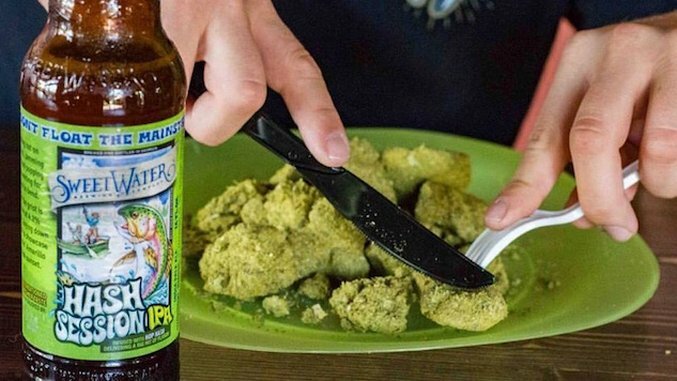 In an industry that’s gone hop mad, SweetWater’s hash innovation shows that there are still new ideas and products, even when it’s been right under brewers’ noses for the entire time. We talked with Nock about hash and more. Paste: How did the hop hash get started? Paste: It’s a byproduct then? NN: Initially it was a byproduct. Caldera Brewing Company (Ashland, Oreg.) used it first but we were the first to make it pretty big. Paste: What are some of the challenges? Do you mix it with a regular hop base? NN: We’ve done both, but for the majority we put it on top of the pellets. Usually the pellets go in first to get the bitterness and the hash goes in the whirlpool and dry hopping. The biggest challenge was probably trying to find it. Once we decided to move forward, we had to reach out to a bunch of people and figure out what they do with it. Because it’s a byproduct the brokers and people pelletizing were just throwing it away. There was one time where we found a nut in the hash. We threw that in the dry hopper and it screwed up the pump. From here on out, whenever we get the hash we have to physically go through it by hand to see that there’s no twine or a nut or anything. Paste: What did you expect the first time you used it? NN: I had no clue. That was the cool thing about it. There are no tests. We didn’t know what the alpha acids were. We just knew it was sticky and resin-y and probably packed full of goodness. Paste: What do other brewers ask you about it? NN: People are unfamiliar with it. I think that’s changing, but you get a “Wow, I never thought about this!” It’s a cool little commodity. Paste: Could it get cost prohibitive if it becomes the next big thing? NN: One of the things about hash is the only time you can get it is when they’re pelletizing. Once they go through their pelletizing run and clean the machines, that’s it. There’s only X amount of hash that gets produced, so you have to stake claims on it right off the bat. Now that other breweries are recognizing it’s something, so are the hop brokers. Paste: How do you balance the limited supply with your brewing needs? Do you call the pelletizer when you need a certain variety? It’s a contract deal. Luckily we were first to the ballgame and pretty much get first dibs. Then we base beers around the hop that’s available. The amount of hash we get dictates how much beer we put out. Paste: How did the transaction happen the first time? NN: In all honesty, in talking to the Hopunion guy I was sold. I brought it to the table at SweetWater and it was “Yeah yeah, another stupid Nick idea.” I had to push for it. Paste: When did you get started at SweetWater. NN: Back when Atlanta had the Olympics, I needed to get out of Maryland. I bartended and did the Olympic thing. I wasn’t planning on staying but I hung out for a bit. I had a New Year’s resolution to get paid for making beer and I started volunteering with a brewpub. A couple months down the road SweetWater offered [a position]. I’m going on 20 years. I’m six months behind the brewery. I’ve seen it grow. When I came there were only three guys and I was the fourth. Now we’re pushing 200 people. Paste: What stands out about how the hop market has changed in that time? NN: When SweetWater opened I don’t think there were any hop forward breweries in town, it was more brown ale. Right now everybody is trying to get the best hops, all the hop farmers are trying to create the best hop. Twenty years ago there might have been 30 varieties of easily accessible hops and now there are 200 or something. Everybody is always thinking about the next thing. Paste: Will that continue: always changing versus focusing on staples? NN: I don’t see it slowing down. Like with the hash, you want to be the first brewery that uses that killer hop nobody knew about.